JNF University (JNFU) will engage and energize young leaders who are committed and passionate about Israel. JNFU was developed for students on campus to offer programming and events, missions to Israel and connecting to other young Jewish leaders. JNFU will bring educational speakers to your campus in order to inform students and give them the tools needed to positively showcase Israel. JNFU is an added value for students that will teach them what Israel has accomplished through fun and innovative initiatives. Brothers for Life (BFL) is an organization in Israel where injured combat soldiers support each other through peer to peer support. The house is located near the airport and is accessible to members 24/7. There is a pool and other activities on the property. Established in 2006, BFL has grown from 40 members to over 780. In August we sat with Ohad Girchish who is the BFL Experience Manager to hear his story. Sderot is a western Negev city that is in the Southern District of Israel. Unfortunately, due to it’s location, Sderot has faced many rocket attacks coming from Gaza. Through it all the city has persevered and the population has grown. The Mayor of Sderot, Alon Davidi, has worked tirelessly to bring more resources to the city so the people in Sderot can live regular lives. Playgrounds, tennis centers and more are being built to meet the needs of the community. We met with the Mayor himself to hear more about the changes coming to Sderot. Founded in 1976, the Israel Tennis Centers (ITC) is one of the largest social service organizations for children in Israel, serving over 20,000 Israeli children every year. The ITC’s 14 centers stretch from Kiryat Shmona in the North to Beer Sheva in the South. Many of these centers are in underprivileged neighborhoods, providing disadvantaged children with a safe, structured and nurturing environment. We met with Yaniv who manages all the centers in the Southern Region. Beit Halochem Canada, Aid to Disabled Veterans of Israel, is a non-profit organization committed to rehabilitating, rebuilding and enhancing the lives of over 51,000 Israelis who have become disabled in the line of duty or as victims of terror. We met with Dr. Moshe Shemma at the centre in Tel Aviv to talk about the services offered to veterans. JNF Canada helped renovate the playgrounds of Ilanot Special Education School in Jerusalem. The school serves children, ages 6-21, with severe motor and cognitive disabilities. The schoolyard is designed to meet students’ physical, social and emotional needs. We met with a mother and son, where the mom told us about her experiences with the school and how it has helped her child. The principal of the school also gave us a short interview. Atachlit Farm is a fascinating community project in Kiryat Gat that helps Jews from Ethiopia to integrate into Israeli life while retaining their cultural heritage. With the support of Friends of JNF Canada, the farm has embarked on two new projects entitled ‘Putting Down Roots’: a social club and an herb-production business. We met with Geula Hadrei, who is the farm’s social coordinator, and was among those who came up with the idea for the spice-production workshop. 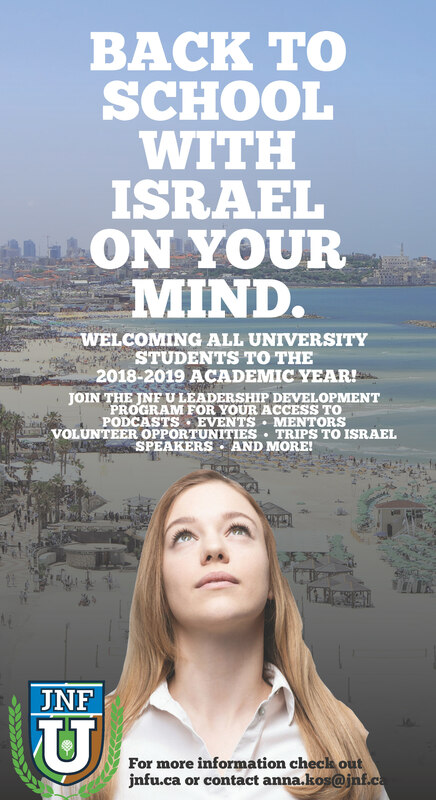 The JNFU Leadership Development Program will span 8 months (September to May), and consist of 4 elements that will collectively build students to be ambassadors of Israel and JNF, providing them with the knowledge and resources needed to positively represent Israel on campus. Each month, students will participate in an educational webinar where they will learn about issues pertaining to the State of Israel and how JNF-KKL is responding to them. In conjunction with Hillel, students will be responsible for planning and executing social and educational events on campus. JNFU leaders will be strategically paired with successful young professionals, community leaders, who will be able to guide them over the course of the leadership development program. 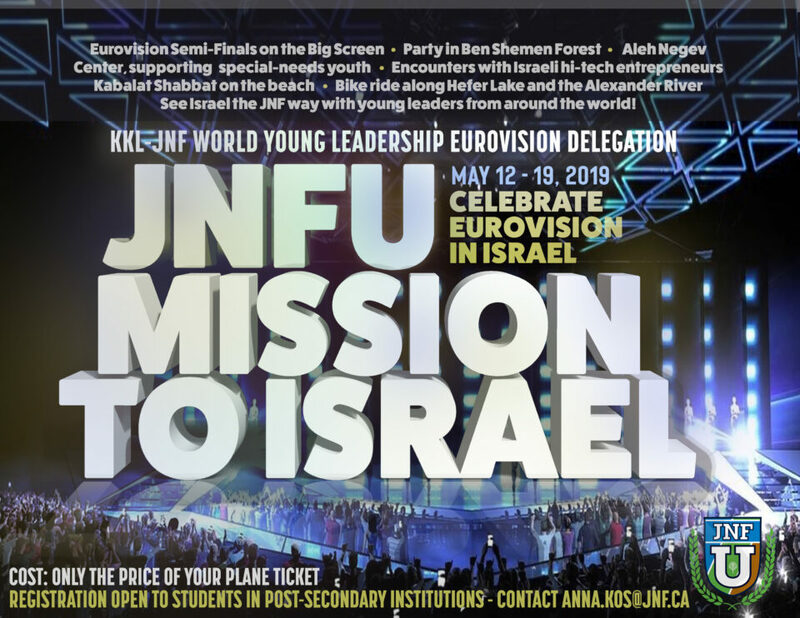 Students who complete the program will participate in a social justice mission in Israel that will give them the opportunity to witness and partake in the extraordinary work of JNF-KKL in Israel. The JNFU Leadership Development Program is being offered on every campus across Canada and is designed to be an added value to already existing student groups. JNF University offers a variety of ways to get back to Israel. From missions to volunteer opportunities, JNFU will help students find their way. CLICK HERE to view pictures from our 2017 Mission to Israel! The Mentorship Program is unique to the JNFU Leadership Development Program (LDP). Students part of the LDP program will be matched with Young Professionals based on their area of study. These Young Professionals will connect with their mentee twice a semester and offer advice on future careers and philanthropic activities. If you would like more information, please contact Anna Kos, Campus & Young Leadership Coordinator, at anna.kos@jnf.ca or call 1.866.775.1563. Join our mailing list to learn about what events and opportunities will be coming to your campus!